Dr. Jean Futrell, Dr. Michael Bowers, and Diane Stephens brought the latest special issue of the International Journal of Mass Spectrometry to life. The issue highlights the modern advances of mass spectrometry. Congratulations to Dr. Jean Futrell, Pacific Northwest National Laboratory (PNNL), on being Guest Editor for the International Journal of Mass Spectrometry special issue entitled MS History: 1960's to Now. Also, congratulations to Diane Stephens, PNNL, who assisted him in coordinating all aspects of this volume. The issue completes a series recognizing the inception of mass spectrometry just over a century ago. This collection of 77 articles includes retrospectives by people who made major advances in the field. Each retrospective is accompanied by current research articles illustrating the impact of mass spectrometry, from fundamental studies in physics to applications in energy. Professor Michael Bowers, Special Issues Editor for IJMS publisher Elsevier, invited Futrell to serve as Guest Editor. They collaborated on the volume's theme and selecting the international experts who participated in this project. Futrell was chosen because of his innovations over more than 5 decades, including the development or major modification of some 20 mass spectrometers. He is known for the invention of tandem mass spectrometry, a technique deployed in nearly every commercial mass spectrometer. 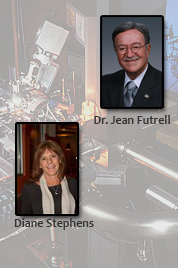 He joined PNNL as EMSL Director and recently was appointed Battelle Fellow Emeritus. Diane Stephens worked closely with Futrell for nearly two years coordinating the creation of this special volume, solving countless issues involving over two hundred individual authors and editorial assistants at Elsevier. Diane is an administrator in the Chemical Physics and Analysis group, and has been with PNNL for 14 years. In addition to administrative duties, she coordinates major proposals, project reviews and conferences. Congratulations to all on an outstanding compendium on the history and role of mass spectrometry in the molecular sciences.